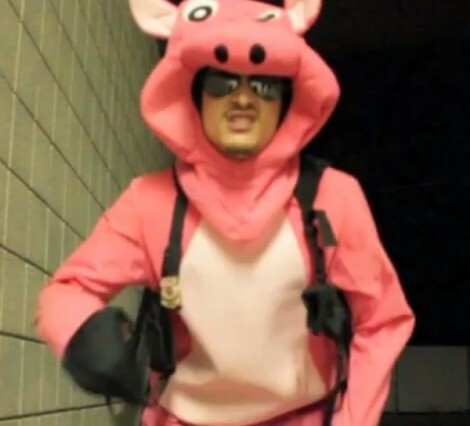 If you weren't distracted by the pig suit, you my have noticed that the song touches on quite a few familiar news stories. The verse where Price says, "If you see the UHP, call a DUI lawyer even if you don't drink," is a clear and not-so-subtle jab at Utah Highway Patrol Trooper of the Year Lisa Steed and her DUI tasing show. There's also mention of the Danielle Willard shooting, where Price raps, "I guess you can't shoot the tire, you got to shoot the driver, even if she's 21, ask her mother after you fire." Price, who is also a member of the rap group L.A.B. (Lunatic Asylum Boys), claims he's not worried about the how the police will receive the video. "I'm cool with all the cool cops," said Price, "I figured the cool cops would feel the same way about it that I do. The verses in this song aren't allegations, these are just things that are facts." The Lunatic Asylum Boys consists of rappers Nik the Sik, Mike Booth, Verse One and Joe Nasty. The group recently released their first self-titled album, which can be sampled via their YouTube channel.